These basic herb garden tips give you a general guide to growing herbs. Consider annual, perennial and biennial herbs for your herb garden plan and try companion planting using herbs. You can grow herbs anywhere a plant can grow. In rows in a garden bed, in raised beds, in containers, or in a no-till garden that you can make yourself. The only limit is your imagination! Most herbs like to grow in full sun, but some will tolerate afternoon, or partial, shade. Your garden soil must be well-drained and as friable as you can make it. Add organic matter if necessary by incorporating manure, compost, or black earth and mixing it well in the bed. If you are growing in the Northern Hemisphere, adding some fish emulsion to your garden bed once a month from May to July will be sufficient to help grow a lush harvest. For Australian growers, herbs will benefit from being fed once a month from August and October, watered well in the hottest months, then fed again in February and March. Let them rest for the autumn and winter months. Depending on which continent you live, some herbs considered annuals are actually perennials in your garden. Lemon Verbena is a woody shrub in Australia that can grow to be tree-size but in Canada it dies back in autumn. Gardening ‘standards,‘ you will learn, change with whatever country or gardening zone in which you happen to be living. It’s important for you to do your own research to find out your gardening zone and whether or not the herbs described here are annuals or perennials. A biennial plant is one that completes its life cycle in two seasons, then dies. Evening Primrose, Oenothera biennis, is an example. The mother plant produces many seeds dispersed by birds or the wind. The seeds lie dormant all winter and start growing the next spring. As the seed sends out roots below the earth and shoots upwards, only leaves appear on top of the soil. 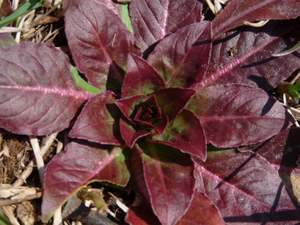 The Evening Primrose plant grows leaves in a rosette formation, flat and close to the ground. No stems or flowers are produced the first year. The next year, though, from the middle of this rosette comes a woody stem that elongates and stands tall above the vegetation. Along the stem grow the flowers which produce hundreds of seeds. At the end of the second season, the plant dies, having performed its purpose of propagating the species. Perennial herbs are plants that, once established, will come back every year to perform their complete life cycle in a few months. Most herbs that we know are perennials and easily grown in garden beds. Plants can be complicated creatures and the botanical world makes for a fascinating study. For instance, did you know that many plants give off chemicals through their roots to either inhibit or encourage the growth of other plants in their vicinity? The world of Companion Planting owes its beginnings from scientists making this interesting discovery. To give your herb garden a little ‘green-thumb’ help, try these combinations when choosing the herbs to grow in your garden. Basil and Lemon Balm like to live together, whilst Catnip and Lavender make great border plants. Hyssop can be of help to Strawberries by deterring beetles. Chives will improve the flavour of Parsley and both can be of help to Roses; grow them all together. Horehound supposedly is a grasshopper repellent. Sweet Marjoram and Sage grow well together. Finally, here are four basic herb garden plans for growing herbs in different themed gardens; culinary, medicinal, ornamental and aromatic.